I've been semi-absent from the blog lately. With the end of summer upon us, lots of people have been going on vacation, and we haven't been able to get a full raid group together for a couple of weeks. I've been taking the opportunity to take a much-needed break from WoW and get some real-life stuff in order. 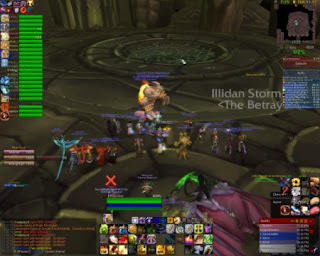 Because of the attendance issues, tonight was our first attempt on Illidan since I last wrote about it 3 weeks ago. We had a few new recruits in attendance, including a couple of people who'd never seen the fight before, so I expected progress, but nothing spectacular. Imagine my surprise when we actually killed him! I'm so amazingly proud of my guild, and especially of the healers, who were even able to keep me alive when I ate a shear on the third attempt. The enrages in phase 5 weren't as bad as I was expecting--Maev only dropped traps where I could use them twice, so I just popped nightmare seeds and ironshield potions for the rest of them. I managed to get video of all our attempts tonight, though the quality is pretty poor because my motherboard fried itself last week. I was stuck on my husband's Linux machine, getting 5 frames per second. But he's converting the video files for me now, so I'm hoping I should have something usable soon. I haven't seen any videos out there of paladins main tanking Illypants, and I'd like to change that. Loots included my T6 chest (yay 5pc! ), and the Bulwark of Azzinoth, which went to one of our other tanks (/cry). There were cheers and high fives all around. I believe on Sunday we're going to go play in Sunwell for a while, which should also be awesome. Prot paladins and feral druids often face a lot of adversity when they're raiding. The vast majority of guilds run with a warrior main tank, and that warrior main tank is always tanking the boss fights. Even the guilds that don't have a single main tank usually have a couple of prot warriors around, and the warriors are always the default choices when it's boss time. Personally, I think this is a really bad idea, and not just because I play a prot paladin. It's true that warriors have the best all-around "grab bag" of tanking skills, but there are a number of fights where the high front-loaded threat of a paladin or the superior physical mitigation of a druid can make the fight easier on the whole raid. Making use of all your guild's tanking classes can make for smoother raids all around. There's also player happiness to consider. Very few players are satisfied with benchwarmer status. I've known a few players with very solid off-tank roles in well-progressed guilds who got bored and left for a main tank position in a less-progressed guild. Sure, they're taking a step back progression-wise, but in the end they're having more fun, and isn't that why we play the game? Relegating some players to forever be "trash tanks" (and what a terrible name that is!) only leads to higher turnover. Plus, it's important to remember: real life happens. If your warrior main tank is sick or on vacation, you need your other tanks to be able to step forward and fill his shoes, or you won't be raiding that night. Paladins and druids require subtly different strategies on some fights, in terms of healing assignments and dps performance. If your tanks and your raid don't have any experience working together on boss fights, you're dooming your raids to nights of frustrating wiping if real life takes your warriors away. My guild handles boss fights, as it does most things, pretty informally. Just before boss time, all the tanks do a /roll, and the winner tanks the boss. This is one of the reasons I love my guild. All the tanks get the chance to tank, and the raid knows how to handle each fight with each different class. There are exceptions, of course. I never bother to /roll right before Kaz'rogal, for instance. While it's true that a paladin can tank this fight, it's one of the few fights where having a paladin tanking will make things significantly more difficult, and increase your chances of wiping (dodge a few too many attacks, and--oops!--I blow up the melee.). Same for Archimonde (Why make the priests burn their fear wards on me instead of themselves? ), or Kael'thas (I don't want to buy all the extra consumables I'd need to tank that!). But on any fight a paladin can reasonably tank, I have as much of a chance of doing it as any of the other tanks. And that, in my opinion, is the way it should be. It's always interesting when something you've always accepted as true turns out to be wrong. Common paladin wisdom has always said that only the first tick of Consecration can be resisted, and the remaining 7 ticks can't. But it turns out the first tick can't be resisted either. The prevailing theory here is that the resist messages you sometimes see when Consecration is first cast are related to a DoT effect that used to be applied to people in the spell's radius. When Blizzard changed the way Consecration works, they never removed the debuff, they just made it invisible. So you're seeing resists for a debuff that no longer causes any damage. I ran across this completely by accident when I was researching something else. I never did find the answer to my original question, either. In other news, I have a WotLK beta key! I've gone through a bit of the Death Knight starting area, because I've heard that it's a lot of fun, and I plan to fiddle with my paladin a bit once I finish that up. The DK starting area and quests are quite interesting. I hope the rest of Wrath is this fun. 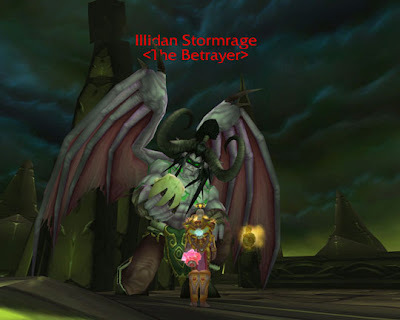 We've been working on Illidan for about 3 weeks, and the fight still feels shiny and new to me. Part of this is because our raid schedule only gives us 1 full night a week to work on him. This week, we only got an hour at the end of tonight's raid, but we still made some satisfying progress. We only got 3 attempts on him, but we got out of phase 2 for the first time, and managed to hit phase 4 twice. I'm absolutely loving this fight, because I'm main-tanking Illypants himself. As a paladin tank, I so rarely get to main-tank "epic" battles like this one, so every time we go up to his rooftop, I feel a little giddy. I stand at his feet and look up at him in awe. I've started recording video of our Illidan attempts, too, but when I watched what I got tonight, I realized that my UI really clutters things up when everything is shrunk down to a manageable size. I hope I can work out something nicer-looking before we actually kill him. On our last attempt of the night, I got killed shortly after the transition from phase 4 back to phase 3 because I panicked, flubbed up my Holy Shield rotation, and got Sheared. That's probably my biggest fault as a raider: when something unexpected happens (in this case, the flame patches from the first phase 3 hadn't gone away yet, and I couldn't figure out where I was supposed to move him), I freeze up more often than not. I definitely need to work on keeping calm under pressure. Illidan presents a special challenge for a paladin tank, because getting hit by a Shear is an almost certain wipe. As long as Holy Shield is up, you can't be Sheared, but because the spell has a 10 second duration and a 10 second cooldown, it will always drop for a fraction of a second due to server lag. It's literally impossible to have 100% uptime on Holy Shield. Murphy's Law dictates that if your Holy Shield drops for 0.13 seconds, Shear will always magically land during those 0.13 seconds, and not during the 10 full seconds when you're safe. This can be dealt with by watching cooldowns very carefully. Shear has a 10 second cooldown as well, and Illidan will always use it within a couple seconds of the cooldown finishing--so approximately every 11 to 14 seconds. This means that if Shear lands when you have 2 seconds left on your Holy Shield cooldown, and you reapply Holy Shield immediately, you're now in danger of being Sheared on the next cast. Staying safe is pretty simple: if you have 4 seconds or more left on your Holy Shield cooldown when Shear lands, reapply Holy Shield immediately. If you have less than 4 seconds left, wait 3 to 5 seconds before you reapply it. Now if I can just remember to do that while giddily trying to pick the boss back up after a transition and move him away from the flame patches (but not too far away), I'll be golden. I usually avoid reading early beta/patch notes, simply because too much changes between initial rumors and final release, but I heard a couple of days ago that Blessing of Salvation was being removed from the game in Wrath of the Lich King. Raiding paladins, does any of this sound familiar? "Can hunters get salv, please?" "We need a rebuff on salv before we start this fight." "OH MY GOD, THERE'S ONLY 3 MINUTES LEFT ON SALV, I'M GOING TO DIIIEEEEEE!" I found myself completely unable to picture life without salv, so I went and read the beta patch notes. Interestingly enough, I don't think the loss of salv will be that big of a deal. Paladins and warriors are both getting a boost to their threat ouput; paladins in the form of attack power now affecting their threat-generating abilities along with spell damage, and warriors in the form of increased threat from Defensive Stance. With the tanks putting out more threat, salv is not as necessary as it once was. Granted, the threat increase for warriors is only 15%, while Blessing of Salvation's threat reduction is 30%, so DPS will definitely have to be more careful. But overall, I have to say I like the change. Fewer buffs to manage can only be a good thing for smooth-running raids. I was somewhat surprised to note that while warriors and paladins are getting increased threat generation, druids are actually getting nerfed slightly in that area--Feral Instinct will no longer increase threat while in bear form. I'm curious as to how this will change the class. Will druids no longer be viable raid-boss tanks? I'll be a little sad if this is so. I've always enjoyed the different strengths of the three tanking classes.